That’s amazing! I cannot believe you are serving in a rural community for two years; it must be so difficult! You are changing the world! Peace Corps volunteers don’t actually do anything. You just want a free trip to Africa, a chance to travel, and a line on your resume (to be fair, most people don’t say this to my face). Well, in reality, it’s a little bit of both. We build local relationships that extend far beyond our two-year service. Cultural Exchange: We give foreigners a view of Americans beyond what they see on TV, and we get a chance to educate Americans on foreign cultures. Every PCV helps bridge the cultural divide, which is much needed in today's world. Sustainability: Sometimes the best sustainability is not a program, but a mindset that people take with them for the rest of their lives. Some people claim PCVs don't make a difference, but we can't always see our influence in the community until after our two years. A Greek proverb says, "society grows great when old men plant trees whose shade they know they shall never sit". Most PCVs will never sit in the shade of the tree they grow, or see the true impact of their service on the community, but that does not mean the impact is not there. There are countless stories of people (and even world leaders) who were influenced by a Peace Corps volunteer in their life. In fact, the volunteer I replaced was a Ghanaian man who had a PCV English teacher as a child in Ghana. He eventually immigrated to America and became a citizen. Once he retired, he joined PC because of his experience with the PCV he knew as a child. Peace Corps headquarters put together the Legacy Project to show just how amazing the PC influence can be. My service has lead to my career choice. I am (eventually) going to grad school to get a Master of Public Health or International Development. I would never have known about these fields if it were not for Peace Corps, and now I can continue aid work beyond my service. 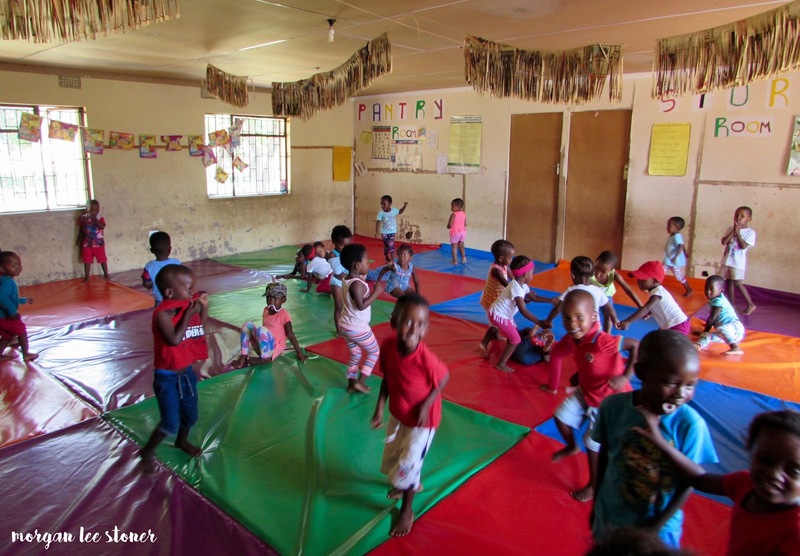 The creche installed a new playroom floor! Does this distract from the heaviness of this post? Posh Corps is the idea that some Peace Corps countries are easier to serve in than others. Whether because of easy access to First World amenities, beach front location, proximity to the States (or other sought-after travel destinations), better medical care, nicer housing options, etc. South Africa has the stereotype of Posh Corps mainly because of our access to the First World amenities that Pretoria, Jo'burg, Durban, and Cape Town have to offer. However, I believe that, A. Posh Corps isn't a thing - every country is challenging and rewarding in its own way, and calling someone's country Posh Corps is demeaning to their service, and B. South Africa is actually quite a challenging country in which to serve for many reasons. Limited communication (with people back home, but even with other PCVs and staff). Limited amenities: no running water, indoor plumbing, air con, TV, Internet, washing machine, dryer, dishwasher, car, (and for some, electricity). Exposure to poverty in a way we have never seen before. Putting life "on-hold" to serve for two years. I do not necessarily feel this way, but it is a common sentiment I hear among volunteers. Low “salary”, if we can even call it that. I’m definitely not saving anything. Proximity to Pretoria: Yes, we have access to First World amenities that many PCVs in other countries do not, but that does not mean we get to go to Pretoria whenever we want. In fact, travel to Pretoria is heavily restricted. It can be frustrating knowing that the First World is only two hours away, yet we are not allowed to go. Sometimes, it's easier to stay in the village when there is no First World tempting you to leave (especially when leaving can result in separation from Peace Corps). First World v. Third World: If you think the wealth gap is bad in America, you have no idea just how bad it can get. It is so frustrating seeing infrastructure, high quality medical care, great schools, etc. so close, yet our communities do not have access to those things. There is insane wealth in Pretoria and yet severe poverty right in their backyard. PC Gossip: Sometimes Peace Corps feels like High School. Everyone is a bit lonely and bored in their villages and gossip is a surefire way to make the time pass. I can't go into more detail about this while I am still a volunteer, but maybe after I COS I'll write in more depth on this issue. Strict rules and regulations: Maybe it’s because PC is a government agency, or maybe because of events in the past, but PCSA is chalk full of rules. PC staff regulates when we can leave site, where we can go, with whom, and how long we are gone. Unlike most jobs, we can get kicked out for things that happen in our personal lives because our job isn't 9 to 5 - we are Peace Corps volunteers 24/7. Most of the rules are made to protect volunteers and make sure PCVs are in their communities, not ditching their work, but when you’re used to living as an independent adult, the countless rules are extremely challenging. Safety and Security issues: Overall, I consider South Africa relatively safe, but there are many dangerous parts of the country. Especially as the only American in the villages, some PCVs are subject to severe harassment and assault. In some cases, volunteers may even have to move to a new village for their own safety. Unlike in most of the States, we have to keep a close eye on all our belongings when walking around the cities (I've had phones stolen multiple times) and every home has burglar bars, huge fences, and security systems. Sometimes I feel like the houses are built for The Purge or a zombie apocalypse. Difficulty working with local organizations because of the "South Africa mentality". Everything moves a bit slower in South Africa. The work day is 9 to 4 (9 to 1 on Fridays), epically long tea times are a common occurrence, and people only show up to events/programs if you have free food. PCVs try to influence change, but we can't force it. You can lead a horse to water, but you can't make it drink. Also, people in the village assume that since we are American, we are rich and can give them free stuff. I cannot tell you how many times people ask me for money/clothes/job/food/sweets (and even get mad when I don't give them anything). Sometimes PCVs feel like they cannot get anything done in their communities, and they feel taken advantage of. It's hard to cope when the thing you are sent to do cannot get done. High ET rate: Contrary to popular belief, Peace Corps cannot force you to stay for two years, so sometimes people leave mid-service. Apparently, PCSA has one of the highest ET (early termination) rates of all Peace Corps posts. Honestly, with everything listed above, this doesn't surprise me, but that does make life for the remaining volunteers a bit challenging. Actually, of the seven people in my cluster (group of volunteers from the same cohort in the same region), I am the only one who is finishing the full two years and officially COSing. It's hard watching my friends go home, even if I know it is the right choice for them. FYI, people can choose to leave early (ET), get kicked out (Admin Separation), leave due to medical reasons (Medical Separation), or leave because of things beyond their control (Interrupted Service). If you noticed, I did not include bucket bathing, hand-washing laundry, peeing in a bucket, giant spiders, etc. on the list (although these might be common concerns among perspective volunteers) mostly because you get used to that stuff quite quickly. Trust me, it seems daunting at first but of all the times I've cried during my service, I've never cried about any of those things. I really hope this shed some light onto my Peace Corps service, Peace Corps South Africa, and Posh Corps.